A new bistro has opened in our rather commercial Paris neigborhood, near St-Augustin, that received three red cocottes from the Lebey Guide to Paris Bistros and a plate from Pudlo, together with the designation "Bistrot classique de l'année." This all seemed promising, so off I went to this attractive bistro, whose owner-chef is Pierre Meneau, son of Marc Meneau of l'Espérance fame (he also trained with Michel Guérard at Eugénie-les-Bains). The food is interesting and well-executed. 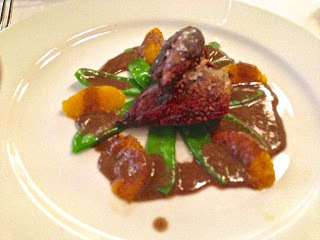 Given the chef's pedigree, you would not expect classic food, despite Pudlo's "classique" denomination, and it wasn't. Nor was the décor, which is clean, modern and comfortable: really not a bistro at all. The hostess, the chef's girl friend, could not be nicer, and I had a lovely table, not guarding the bathroom as is often the case when I dine alone. I started with a glass of champagne, accompanied by two foie gras crom'esquis -- little fried pastry balls with melted foie gras within -- which I found surprisingly unexciting. 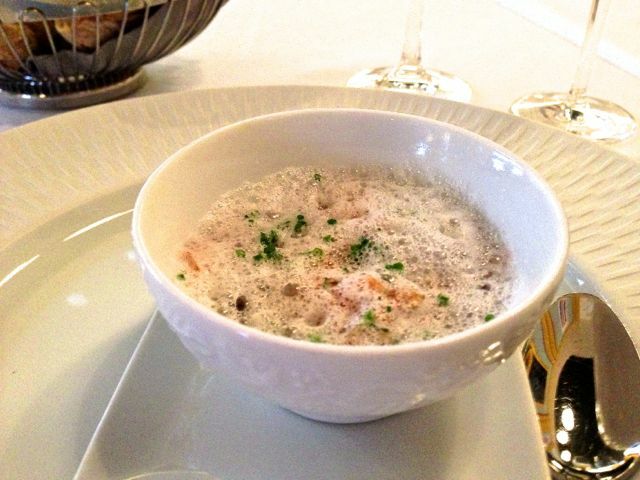 There followed a lovely amuse-bouche, a foamy soup whose ingredients I can't remember. Next, pigeonneau, the night's special, which was divided into leg quarters that you eat with your hands (fingerbowl provided) and boneless breasts, all perfectly cooked. 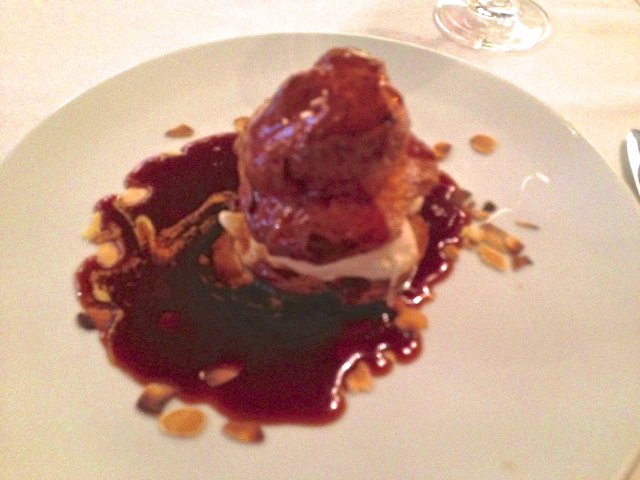 Finally, a big profiterole with homemade vanilla ice cream and the best-ever salted butter caramel sauce. I know a lot about salted caramel, so I felt emboldened to chat with the chef about the sauce; after a few minutes of modest protestations, he let slip that he adds a little cognac after stopping the caramel from cooking by the addition of water, and before adding the salted Normandy butter. Sounds simple enough but it is not easy to make a caramel with such exquisite taste (deep, but without a trace of bitterness) and the perfect viscosity to pour over the profiterole. I returned a week later with J, and it was just as good. She had the pigeonneau, while I had quasi de veau (closest translation is rumpsteak, I think). I couldn't resist getting the proferole a second time, but this time the two of us shared it. Still fantastic. The evening's very nice amuse-bouche, still pretty foamy, was based on smoked salmon. And I had a poached lobster appetizer that was really excellent, despite my general view that French lobster is not as good as the American variety. The price is not low, about $100 per person with the champagne and a nice glass of Santenay. There are lunch menus at 28 and 39 euros. All in all, this is a very good, but not great, restaurant, that is a welcome addition to our Paris neighborhood; indeed I wish it was in our neighborhood in New York. Crom'exquis, 22, rue d'Astorg, Métro St-Augustin.